The North Neo is the basic kite in the 2011 North Kiteboarding line-up. The kite first made its appearance in 2010, and very little has changed in the 2011 model. The kite is intended as an all-round kite with direct feedback and quick reaction to steering commands. The design is clean, simple and durable. North made some adjustments to the 2011 bars. New material is used to improve the grip and a transparent depower knob has been introduced. Also, knotting the safety as was needed in the 2010 bar is no longer necessary. North now offers two bars, the 5 line Trustbar 5th Element and the 4 line Trustbar Quad Control. Both bars come standard with 24 meter lines, but can be fitted with shorter 20 meter lines also. it does not offer the same level of safety of the 5th Element system. The Neo is put in the market as a basic kite, offering good value for money. It is an allround kite with a lot of depower and plenty of feedback through the steering lines. On top of that it re-launches easily. 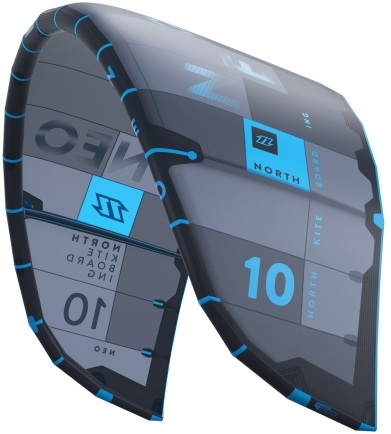 The 2011 North Kiteboarding Neo is a basic kite, and it first sight not much has changed compared to the first Neo, the 2010 model. By looking at it I get the impression that the Neo is more C-shaped than the 2010 model. The Neo has three struts with reinforced seams on them. Other North kites come equipped with a one-pump system in 2011, but you have to inflate the tubes of the Neo one by one before filling the leading edge. As the 2010 model, the 2011 Neo can also be controlled with both a 4 line as a 5 line bar. Once you have the kite in the air and you hit the water you feel the difference between the 2010 and the 2011 model. The 2011 Neo turns quicker and has a bit more de-power. In the low-end the Neo feels somewhat unstable, overreacts a little to gusts and is therefore a bit restless on the edge of the window. However, if you have a bit more wind and more power the kite can offer you a kite with good feedback through the steering lines. The controllability of the kite in jumps is good. You get easy handling with enough pressure! The Neo is a good kite for wave action. The turns are quick and the feedback is good (also when depowered). If you move along with the kite when riding a wave, tension remains on the steering lines (downwind float of the kite). But remember that the kite performs less well in the low end; in that case you might want to choose a board with a bit more volume. Here comes the exciting part of the test, the conclusion. How tangible are the results of our test? This is not a scientific test, and the validity of just a few individuals is limited. But by grading the kite on 24 characteristics we strive to give insight into the way a kite reacts in real life (evidence based). The 24 characteristics are the different ways we feel what the kite does. The mix or combination of these characteristics is what gives the total feeling of the kite. You might ask what the reason is for writing the previous paragraph. Well, the 2011 Neo and the 2010 model do not differ all that much. However, there are subtle differences. Whether the difference in feeling is due to fine tuning by North, different conditions while testing or a different series of production? That is what the tester needs to find out and describe in the conclusion. What is the difference in this case? The 2011 Neo turns quicker and has more depower. It loses some pull in the low-end, which is translated in less stability in light wind conditions. Even a small change in the placement of a bridle can make a difference in the way a kite feels. That is why the manufacturers spend so much time on the design, the testing and the production process of their kites. This to ensure that their kites feel the same in New York, Amsterdam, Perth or anywhere else on the planet. Super safe when using 5 line system. When using a 4 line bar the kite will not fully depower when using the safety. I tried this kite the other day in 12m, looking for a low wind option as my biggest kite doesn't pull my weight in sea breezes (9m Evo). The kite is super simple and very user-friendly. Good drift and quick turning (turns like a 10m Evo - or 9m standard kite). Easy launching like the Evo, solid bar pressure. Turning radius is different from the Evo as this kite is more C -shape - and it looks smaller than its size. Probably has a good range, but the wind was constant and I didn't need to tune the power at all. 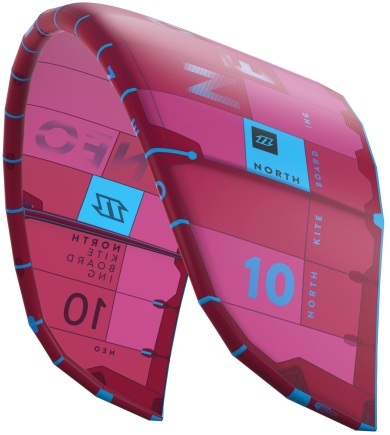 I'll probably buy this kite as a light wind wave/freeride option but for stronger winds I'll be using the Evos in smaller sizes as 3 struts in strong, gusty winds don't seem like a good idea. No one pump is no big deal for a 3-strut kite, gives you the chance to get onto the water quicker if you leave the kite semi-pumped. The new North valves are excellent as is the overall build quality and new kite fabric. The 2011 bar is a prettier version of last year's excellent bar and nothing more. Excellent learner kite, excellent wave kite, no idea for jump as I was riding strapless -I'm told the hangtime is good maybe even better jumping than the Evo.